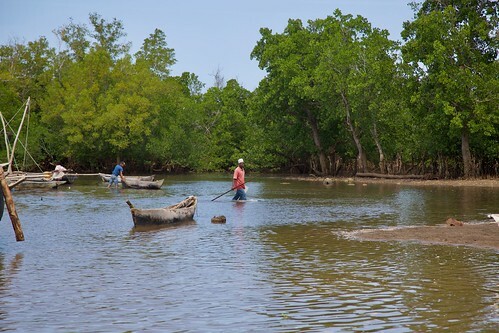 Fishermen in the coast of Gazi Bay, Kenya. The livelihoods of many villagers from Gazi depend on healthy blue forest ecosystems like mangroves. Mangrove forests not only serve as shoreline protection against storms, but they also serve as nursery grounds for a variety of marine animals of commercial value. This photo was taken during a site visit for the GEF Blue Forest project www.gefblueforests.org.